Why Do You Need To Feel The Power Of Awe? When you walk down into the Grand Canyon, a natural gorge that’s 270 miles long and 6,000 feet deep, nearly 2 billion years of Earth’s terrestrial history exposes itself before you. In that moment, an overpowering sense of awe fills you. You stand frozen as you take it in that it took the Colorado River six million years to carve this valley into its intricate patterns and colors. But what it is to be in the grip of awe? What is awe? Awe is not fear. And it’s not mere wonder. Awe is not fear, because fear makes you turn away. And it is not a mere sense of wonder, because wonder doesn’t frighten you. It’s a fusion of both, and yet more. You get awe when you brew a mix of fear, admiration, delight, and surprise. It’s an intriguing, and yet powerful experience. You feel it when you are fascinated by a grand spectacle, exceptional and extraordinary. As it holds you in a mesmerizing grip, you realize it’s unlike anything you have come across before. You’re afraid, and still you stand to devour its thrill. Perhaps it can’t be explained nearly as well as it can be experienced. This is a quality of awe not shared by any other positive feeling. Are you capable of feeling awe? Do I feel a positive emotional connection to people, music, art, or nature that evoke a sense of wonder in me? Do I seek out fascinating experiences that challenge my understanding or expectations about the world? Do I feel like a child who is awestruck when I face novel experiences, outstanding ideas, or beauty of nature? Do I look for and nurture the incredible moments that inspire awe in me? Do I often marvel at how amazing it is to be simply alive in this world full of uncertainties? How Can You Feel Awe? You can feel awe gazing into the vast expanse of a star-filled sky. You can get awed at our planet turning around in a black sea of the nothingness, caught by an astronaut’s camera from his post at International Space Station (ISS). A double rainbow over the Niagara Falls. A full moon lighting up the Taj Mahal. 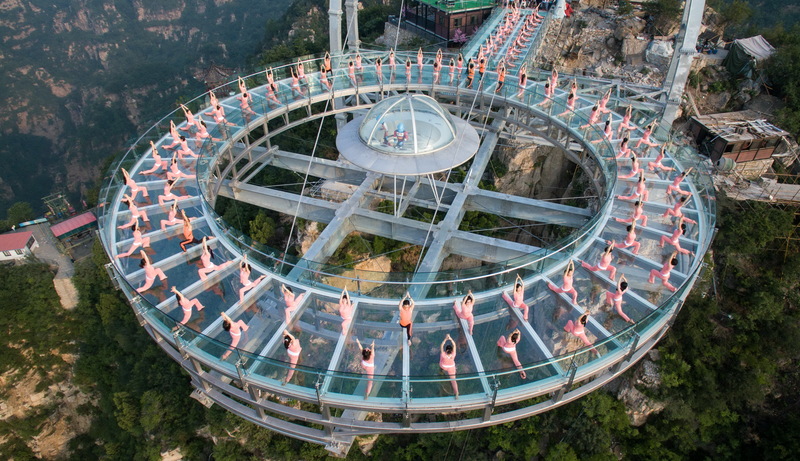 One hundred and fifty people practicing yoga on a sky-high glass platform on the outskirts of Beijing. But those are not the only places you can find awe. To feel awe, it does not matter where you stay. Awe is not simply a sense of wonder, but one that peeks from behind a veiled sense of ordinary fear. And so, it can happen anywhere. Awe can be found in our daily lives. You could stay in an ordinary neighborhood and still feel awe in watching the morning sun come up against a dusty sky. Or in seeing a small plant forcing up through the cracks of an abandoned concrete plate. Or in hearing the sudden burst of your child’s unbridled laughter. A 2015 study in the Journal of Personality and Social Psychology suggested watching an astonishing nature video and gazing up a towering tree to fill yourself with awe. The last one has a story. Paul Piff, a professor of psychology and social behavior at University of California, Berkeley, staged an experiment in a grove of blue gum Eucalyptus trees near the university’s museum of paleontology. Brought from Tasmania, and planted there between 1910 and 1914 by an Oakland developer Frank Havens who wanted to get rich quick by selling them as timber, these trees are now the tallest stand of hardwood trees in North America. Just looking up at them can create an enormous sense of awe. Participants in the Piff’s experiment took one full minute to gaze up the height of these trees, some of which easily tower to 100 feet. Then they came upon a passerby who, once he got close, stumbled and dropped a bunch of pens in the soft dirt. These participants, who were now filled with awe after watching the giant Eucalyptuses, picked up more pens for the stranger than a control group who had looked at the nearby science building. Women feel awe more frequently than men. The ability to feel awe increases with age. What Awe Does To Us? The experiment at the Eucalyptus grove showed the world awe can make us more sympathetic and helpful. But awe can also inspire a host of other feelings in us. Awe creates a deep state of curiosity in which we sense the world without the filter of our experiences. 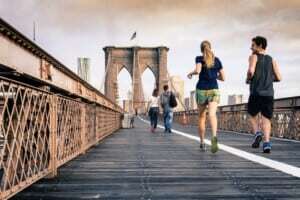 According to Michelle Lani Shiota, professor of of psychology at Arizona State University, awe involves a sense of uncertainty that we are compelled to try to resolve. Research by Piercarlo Valdesolo suggests awe makes us less tolerant of uncertainty, which in turn makes us more likely to detect both human and supernatural agents outside themselves. Your body reacts to awe in a very different way than any other positive emotion. You gaze deep at your thing of awe, standing wide-eyed in a shock of fascination, stuck motionless to the ground beneath your feet, your jaw dropped open, your inner eyebrows lifted, and your heart slowed down. It stops the sands in the clock, and time stalls. An experience of true awe engulfs you and re-frames your life in a way you never imagined before. It elevates your soul. By the way, that overused urban buzzword “awesome” — a foppish word in every sense — can never stand a tolerable yard close to the sublime awe. Here’s the Medium post decrying The Death of Awe In The Age of Awesome. How Does Awe Make Us Better? How many times have you been struck by awe in your life? Perhaps many. But did you ever stop to think how did it influence you? How did it affect your behavior and your relationships? When you sense awe, it can also make you feel more generous and humble. Awe makes you feel more satisfied with your life in the moment. After awe, you start to value experiences in a greater way than things and stuff. Awe diminishes our sense of self and shifts our focus away from selfish interests and concerns. After awe, you tend to cooperate, share resources, and sacrifice more for others. Those who experienced awe reported a feeling of a “small self” triggering more generous behavior. Awe can sharpen your thinking, and can even make you less vulnerable to weak arguments. Awe reduces reliance on your internal knowledge in processing new events, as a 2017 study found. Shiota and Keltner found in a separate study that those who regularly found awe scored more on openness to experience and extroversion in the Big Five personality scale. How did awe originate as a human emotion? When did we first start to feel awe? Awe started out as an overwhelming feeling when humans were in the presence of something extremely powerful, so much more than anything they have ever seen. This original awe was reserved by the early humans for their gods and kings. Dacher Keltner and Jonathan Haidt suggest that our emotion of awe originated from feelings of primordial awe. This primordial awe would occur when a high-status person who was vast in size, fame, authority, or prestige, came in presence of a low-status person. This required the latter to change the mental imagery of his known world to accommodate this new experience. This primordial awe later generalized into any stimulus that was both vast and that needed accommodation, and became our modern awe. Since those days of early human history, awe remains. And it remains to serve us to see the extraordinary within the ordinary. So get out into the nature, visit an art show, hear some beautiful music, and take time to marvel at the wonder around us that is life.